Annemarie Hassett became the executive director of the NYU Law’s Engelberg Center on Innovation Law and Policy on January 12, following a distinguished career in complex civil litigation, in particular intellectual property litigation. Hassett has been a litigator for more than 30 years, most recently as a senior partner at Goodwin Procter in its patent litigation practice. She was also a partner at Kirkland and Ellis and a member of the firm’s intellectual property litigation practice, and practiced at Fish & Neave. Hassett received her BS in chemistry from the State University of New York at Albany, MA in chemistry from Harvard University, and JD from Hastings College of the Law, University of California. 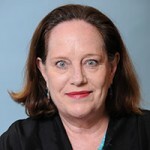 She is currently second vice president and serves on the board of the New York Intellectual Property Law Association.